Are you a prospective student or alumni who is interested in architectural engineering, architecture, city and regional planning, construction management, or landscape architecture? The CAED Student Ambassadors are pleased to assist with your visit! We offer an overview tour of all five departments each Monday at 11:10 am-12:00 pm and Friday at 10:10-11:00 am (see exceptions below). Registration is not required for our regularly scheduled tours, however it does help us plan our tours better. Additionally, we will be offering daily Green and Gold Tours to newly admitted students each weekday from April 2 to 11. Each Green and Gold tour will meet in Building 05 Staircourt at 11am; the tour will conclude by noon. College tours begin in the lobby of the College of Architecture & Environmental Design, Building 05, Room 212, and are led by the CAED Ambassadors. If you are visiting when tours are not available, you may use the Self-Guided Tour Map to explore our facilities. To learn more about the CAED Student Ambassadors click here. For questions or additional information, contact the CAED Ambassadors at caedamb@gmail.com. CAED tours are NOT available during the first week of the quarter, finals week, weekends, holidays, winter break and summer break. (Click here for the current academic calendar). Architecture Bldg. 05, Room 212. 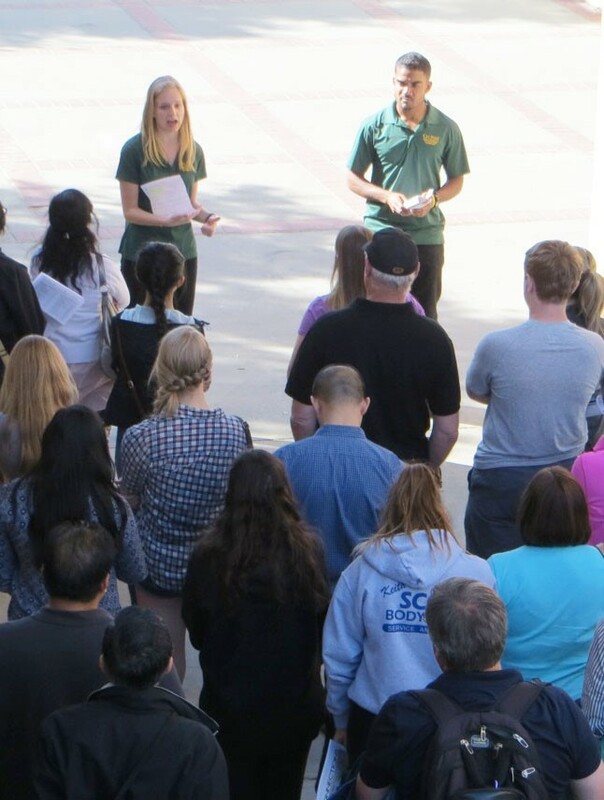 You can register for a university campus tour, housing tour, or CAED tour at Cal Poly Guided Tours. For prospective and newly admitted students, here are a list of CAED FAQ's commonly asked during the Ambassador tours. Be sure to allow time to purchase a parking permit before the tour. Daily parking permits can be purchased for $5.00 at the visitor information center at the Grand Avenue entrance of campus, or at pay stations found in General Parking lots. Metered spaces are also available throughout campus, though many have time limits of less than two hours. A campus map shows nearby parking lots and pay stations (for a legend of parking symbols on the campus map, click Help and on the drop-down menu, select Parking). Parking on campus is limited and lots are spread out, so allow extra time to walk from your car.